I just bought a winchester ultimate shadow s/s in .243 and i'm planning on getting it shortned it as much as possible and putting a can on it. I have a couple of questions. How short can I get it cut down without making a meal of the rifle. Am I better off getting an overbarrel type or front mount suppressor. It will be a bush stalking rifle so as long as it shoots accurately out to 200m max ill be happy. Most deer I encounter in the bush are less than 50m. I have a rem 700, cut at 18". Running 55gr Nosler BTs. Have shot wallabies out to 400m and rabbits at 350m. gadgetman, northdude and Tim Dicko like this. i can say having taken a 243 from 20 down to aprox 18" the muzzle blast and flash at dusk is significant & your hunting buddies will not appreciate it. You need the suppressor. As its a bush rifle I would be going for the over barrel. 1, its shorter and 2, it will be stronger having 2 points of contact on the barrel for that day you knock it against something. The shortest over barrel suppressors add aprox 80mm. over barrel for a bush rifle, more compact and helps keep weight further back than muzzle forward one .don't know about barrel length but interested about what works as was thinking of shortening my bergara to minimum length. Got a 75 Finnlight. Had it threaded at its std length 20in by Dan Hardy .Got a Dan Can on it probably a Gen 3 . When I got it back swore like crazy that he had not threaded it. Man he did an invisible cap over the thread.Really impressed still after all these years. 2 shots over Easter 2 dead deer all at 300 to 320m. Swings beautifully. 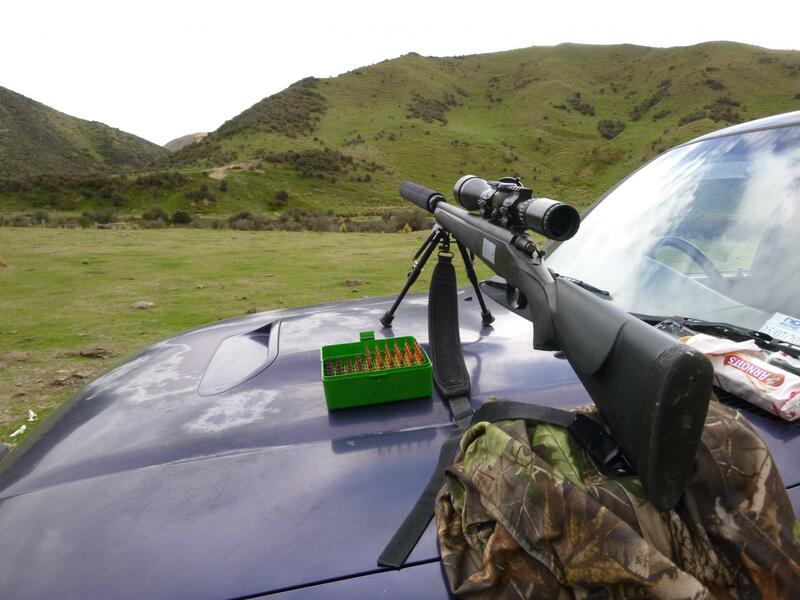 Mate bought an X Bolt 223 and had a Dan Can put on it but no chopping[reliant on advice from the store he bought it over Whakatane way] He kills a lot of deer with it but is unhappy now with the balance having tried out our T3's 223 with Tok Can and chopped at 19in by Darren.We use 7 baffles including a stainless at the muzzle. Swore when he cut it at 19 after wanting it at 20in but the balance is superb.Different strokes for different folks. I can cut 90mm off that makes rifle 770mm long .made enquiries about a second barrel was told not much less than complete rifle so still thinking about it. That is a cracker foto. I load for my dads Model 7 243 with a factory 18.5" unsuppressed barrel. The lads are right when they say you will need a supressor at that length, she's a mean little hua! Loud as all hell and a mean muzzle flash. I wanted him to be able to shoot Reds out to about 350 yards with it, so have loaded 100 gr sierra Gamekings, with 7828ssc ive got them going just shy of 2900, whereas the factory 100gr stuff is only doing 2600 fps from the 18.5" tube. Thats not a concern at all if 200 yards is your intended max range. Old family acquaintance years did some shooting with a little rem 788 243 with the factory short barrel. It was a tack driver but this story involved him shooting over the roof of his car as a rest. Bloody thing left funny scorch marks on the paint. Still under warranty and something happened with that but not sure.